222 Bowery (between Spring and Prince), aka the Bunker. 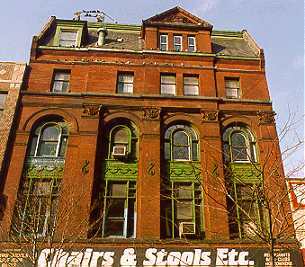 A five-story building of Philadelphia brick trimmed with terra cotta and Nova Scotia sandstone. Gabled mansard roof and arched third-story windows with Corinthian pilasters. Designed by architect Bradford Lee Gilbert; built in 1884.